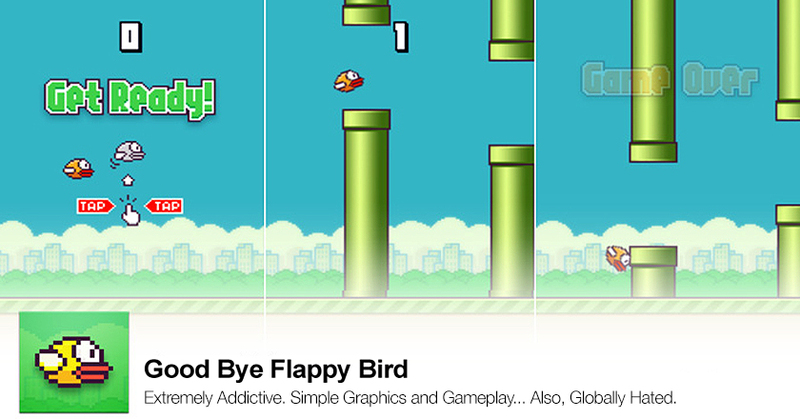 Home News GoodBye Flappy Bird: For Good or For Worse? GoodBye Flappy Bird: For Good or For Worse? Highly addictive and even heavily despised, Flappy Bird has been pulled off from the Android and APlle Stores by its developers. Apparently, the decision comes from Dong Nguyen the founder of Flappy Bird himself as he claims that the decision is inspired by no legal issues. It’s just that he had enough. Dong Nguyen was apparently making USD 50,000 per day when he came out publically with the decision to pull down the most downloaded game last months on both, the world’s leading platforms. The graphics was not extra ordinary, nor was the game play long. It was actually a 2D retro styled, 500 KB something game that progresses in a loop, literally. So, how did this simple game get 10 million downloads in the cluttered Android and Apple markets? Well, the answer is simple – cuz’ people hated it. The game is perhaps THE most irritating piece of simple coding that modern era of smartphones have ever seen. The most irksome aspect has been that ‘Flappy Bird Seemed so simple to play’ yet once one starts to play to realize that it’s much easier said than done. Some even claimed that the game is the evilest game on the market, as it’s made to be highly catchy and equally impossible. Dong Nguyen, was also condemned earlier of copying the tunnels form the famous Super Mario. He has fallen victim to many controversies ever since he launched the game, and till now he tolerated all of them. However, the decision of taking down flappy Bird does not imply that the developer would not be making games at all. With over $50,000-per-day in revenue and hundreds of thousands of downloads the app with the yellow and orange bird certainly proved that there is a place for 2D mobile games in the video game industry.